Who loves their bed?! I love my bedroom and my bed so much, it is the one place where I can relax properly, don’t feel like I am surrounded by jobs to do, and where I can switch off from the day. So to me it is really important to have my bedroom to be decorated nicely. 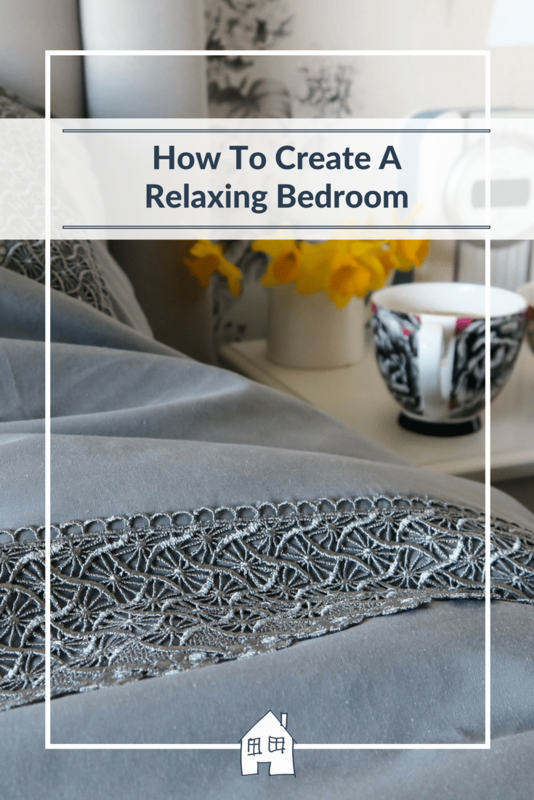 Here are my 5 ways on how to create a relaxing bedroom, which will help you relax and unwind from your day. We have grey and white, and as soon as I completed this room I felt relaxed in there. They are not hash on my eyes, they are calming and my brain doesn’t have to deal with lots of colours coming out at me in the evening. However the colours are so easy to work with, and add in a shot of colour into the room if you want. I really dislike strong lighting in my home anyway, but even more so in my bedroom. So pop in some little bedside lights that let off a subtle light. Ceiling lights can be strong, and do what they are meant to and light up the whole room. This isn’t very relaxing, even include some candles to create even softer light. Nothing beats getting into bed at the end of the day, snuggling down under your duvet and relaxing. 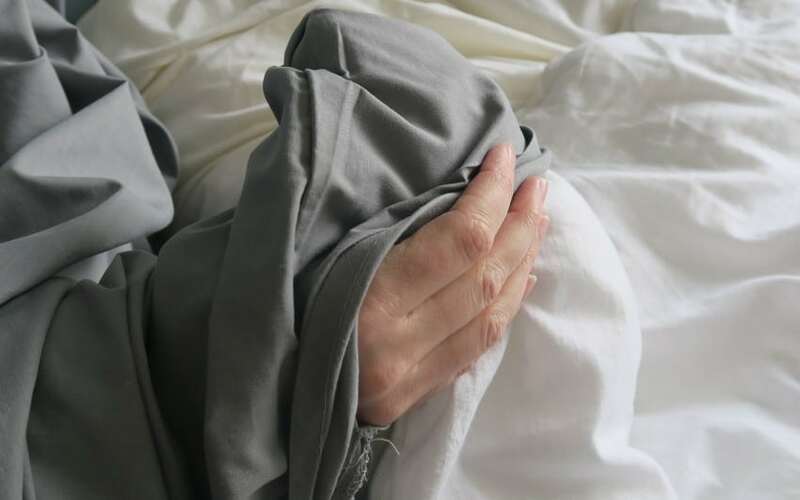 So get some soft linens, that are kind on your skin and enjoy that feeling of snuggling down. Fluffy cushions and throws are perfect to build a little fort around you! I love nothing more than getting into bed with a cuppa, resting my back on my cushions and pulling the throw over me to keep me extra warm! I think bedrooms should have carpets, and soft ones too. When I step out of my warm bed I want to put my feet on a warm floor. We splashed out a little more than usual on my bedroom carpet, and got a iSense carpet, I have never felt anything so soft before! 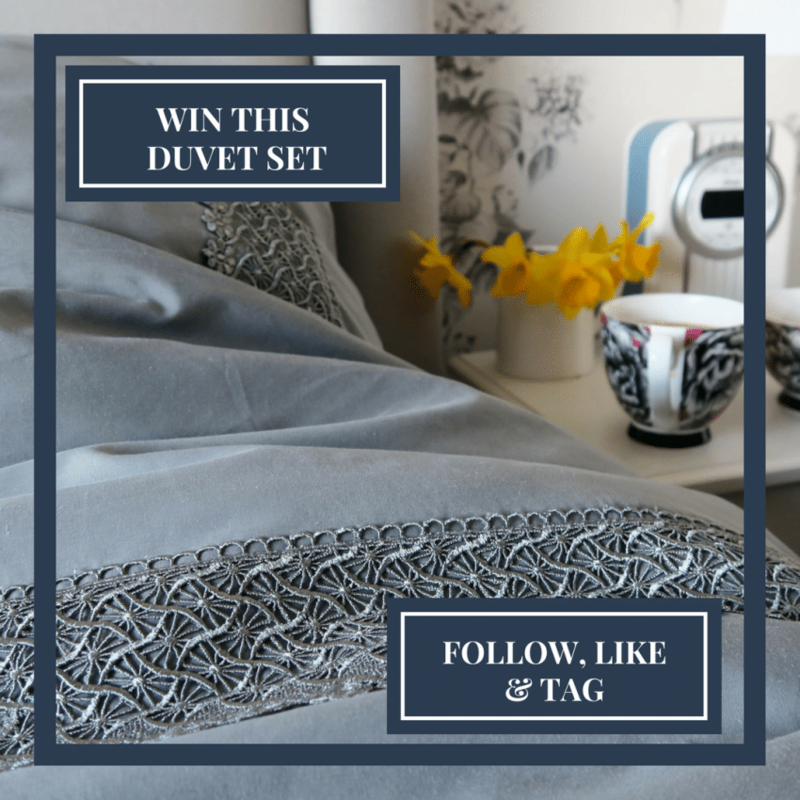 So I thought I could help you out and make your bedroom space relaxing and pretty, and bring you a giveaway. I was sent a beautiful duvet set from Rooi. Rooi is an affordable luxury living online shop, that brings together a modern, East-west fusion of home décor. 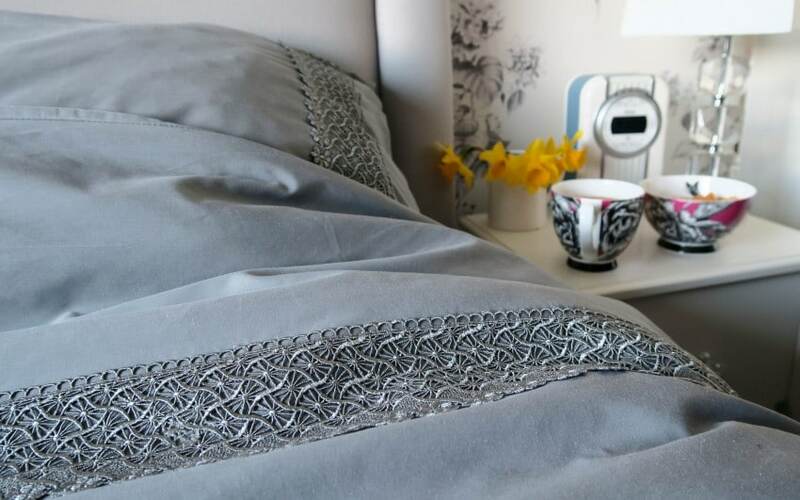 The Aria Grey duvet set comes with a duvet and 2 pillows, with lace running along the top and sides of the pillowcases. It was the lace that stood out to me, it made the duvet so pretty but not too fussy for my husbands taste. They have even added in hand holes to make changing the bed easier! I was really impressed with the quality of this duvet set, priced at only £29.95 for the double, and £35.95 for the king, I think this is really reasonable. It was soft to sleep in, and I had a very good nights sleep. Only problem was I didn’t want to get out of bed even more in the morning! As it is Mothers Day, I thought it was a perfect day to feature this duvet. I am looking forward to my breakfast in bed! How are your Mothers Day mornings? I always remember bring my Mum breakfast in bed, with a Daffodil picked from the garden and placed in a little vase on her tray. So would you like to win a set for yourself? Then head over to my Instagram account and get your entry in. Tag a friend who would love to win in the comments below! Every comment is an entry so tag as many different friends as you’d like in the comments for more chances to win. Soft flooring idea is impressive. Can you please write only about soft flooring? I think a good number of people seeking for this topic. BTW thanks for sharing this awesome bedroom relaxing article to use. I also pleasure to get this article from here. A relaxing bedroom is a must. That bed set is stunning. I’ve entered on instagram, but I liked this blog! Im looking for bedroom inspiration and this has definitely helped! Working shifts opposite shifts means our room feels like it’s in perpetual darkness! There is always someone asleep! It certainly needs a new calming influence!! My husband works night shifts, so I know what you mean! Entering this and hoping to win this as a surprise for my mother! Fabulous, I’m tagging my wife Michelle wild, a splendid creature. Often our room gets left till last to be done! The lace is really pretty isn’t it. Beautiful ideas! A bedroom to actually be able to relax and chill in would be a wonderous thing. Thank you, I find it so calming but also I know if I want to add some colour at some point I could easily. Thank you, simple but effective I think! Haha!! I hate cold toes, and I always have cold toes! 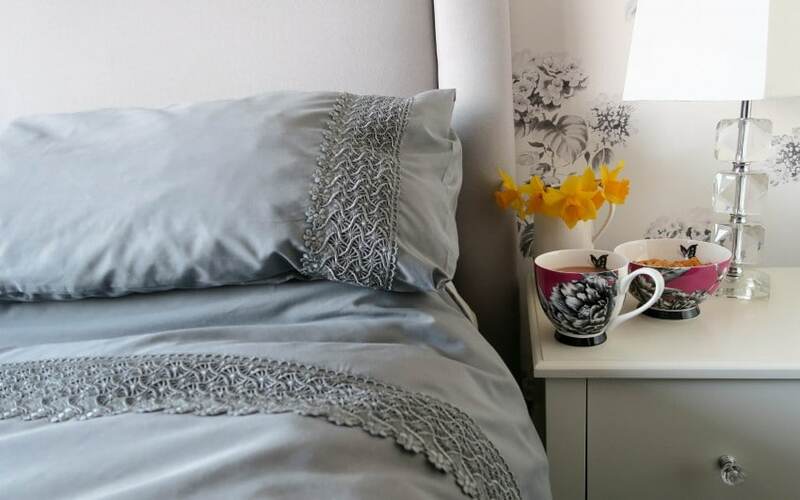 I definitely think that colour plays a massive role in how calming our bedrooms are – the duvet is a stunning colour! I love the lace detail on it, really pretty. 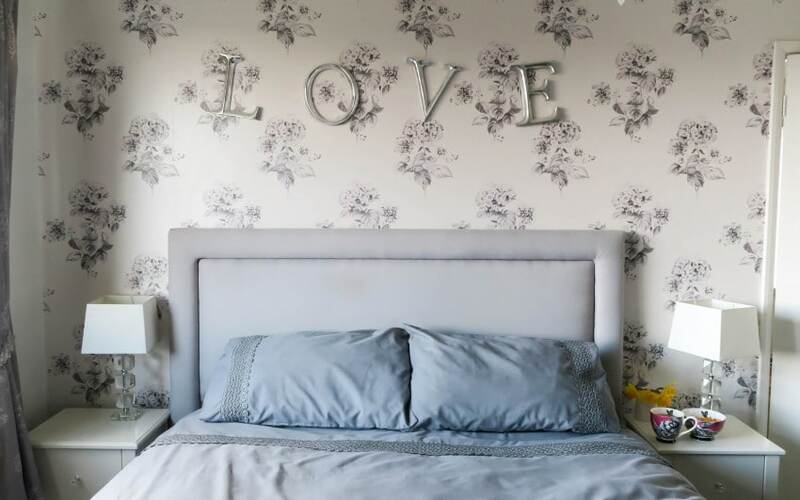 Great post my bedroom is my calm place I love grey bedding. I love getting into bed when it is all snuggly! Hi Tracey, you will need to Tag the person on the Instagram picture to be entered into the competition.